Enhance the traditional style of your home office with this functional locking lateral file to protect and organize your important documents. The two locking file drawers take letter or legal files for versatility. The anti-tilt mechanism and levelers assure this piece will safely work in your space. 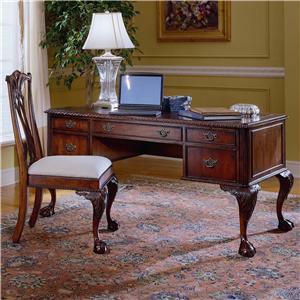 Quality constructed of Hardwood Solids with Cherry Veneers with ornate carved details for an impressive work space. The 434 Traditional Lateral File with 2 Locking Letter/Legal File Drawers at Sprintz Furniture in the Nashville, Franklin, and Greater Tennessee area. Product availability may vary. Contact us for the most current availability on this product. Filing Capabilities All file drawers feature sturdy drawers which move smoothly on steel ball bearing slides for easy opening and closing. File drawers will accommodate both letter size files and legal size files. 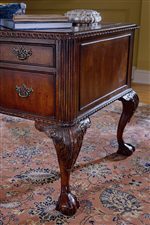 The 434 collection is a great option if you are looking for Traditional furniture in the Nashville, Franklin, and Greater Tennessee area. 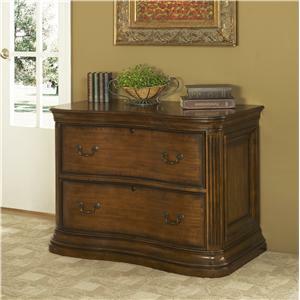 Browse other items in the 434 collection from Sprintz Furniture in the Nashville, Franklin, and Greater Tennessee area.